By TruePublica: JP Morgan’s chief executive, Jamie Dimon has spent a career challenging honesty, decency, morality and the rule of law. Here, we see him taking aim at socialism in his annual letter to shareholders who warns in America that it would be “a disaster for our country”. Dimon, by far, is the world’s most powerful banker and has attacked socialism, saying it produces “stagnation, corruption and often worse”. He would of course. But this attack shows something about people like Dimon and the world we live in. Since the rise of Donald Trump to The Whitehouse, democratic socialism has started to be be embraced by a new generation of politicians. This is seen in people like New York congresswoman Alexandria Ocasio-Cortez, supporters of Bernie Sanders and Senator Elizabeth Warren, who have called for tax rises on the very rich, the breakup of big businesses and greater regulation of banking in particular. 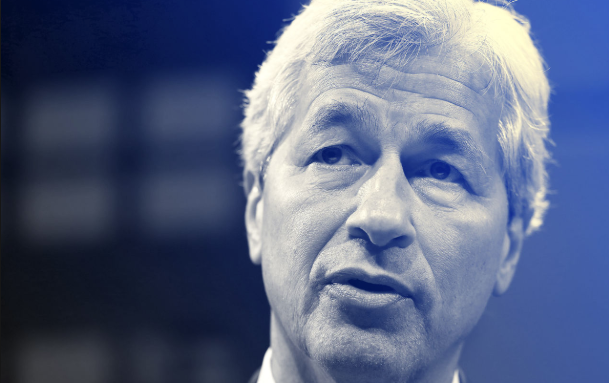 Dimon’s letter to shareholders begins by moaning that America’s corporate taxation is too high, albeit that Trump’s recent tax breaks gave JP Morgan a near on $4 billion windfall against its $33 billion profit and substantial stock price gains. Dimon goes on to trumpet his performance since becoming JPM’s CEO. He also heralds the fact that JPM has bought back $55 billion of its own shares – a practice that would have been illegal prior to the 2007 financial meltdown caused by the banks. And Dimon’s egotistical diatribe drones on and on in his shareholder’s report. For all of this ramping up of rhetoric against socialism, different of course to democratic socialism, Dimon continues to decry three important points. First, if it was not for the likes of criminal banking organisations and their casino operations such as JP Morgan, the world would be considerably better off. The second point is that everyone else has paid the price for Dimon’s egregious and criminal management of the bank – in other words, socialism has saved him and his bank from bankruptcy. Third, the world is still suffering from the financial crisis caused by JPM and the like. And so to say that socialism inevitably causes stagnation in a world that has effectively stagnated and then become unstable (due to the crisis that unfolded) is obviously a moment that demonstrates the deep psychological flaws of people like Dimon. JPM was fined $13 billion for its role in the mass mortgage fraud that largely made up the 2007 financial crisis. This is the biggest fine ever metered out to the banking industry. The bailout of the banking industry in the USA alone continues and has cost over $4 trillion to date with a further $16 trillion in state guarantees still outstanding. This is socialism on the grandest of scales imaginable. JPM has effectively privatised its profits and socialised its debts. All the banks that needs bailing out did the same. The list of crimes committed by this one bank alone is a statement of intent by it and the American way of government. It is a statement that says – the fines metered out for its criminal activity is merely the cost of doing business. Forget the people, their homes, their retirement plans and the communities they destroyed on the way. About 10 million homes were repossessed in the immediate years that followed the financial crisis and a decade later millions are still struggling. As a company, JPM has been convicted of fraud so many times, they can’t be listed here without boring every reader into a deep sleep. However, to make it short these crimes go from misleading investors, foreclosure abuses, robo-signing, mortgage fraud, energy trading fraud and abuses, illegal credit card practices to the London Whale scandal. From breaking state and federal laws over mortgage-related securities, institutional mortgage and investment fraud, toxic mortgage selling leading to the world’s biggest fine, Libor rigging, currency manipulation and others. All in all, JP Morgan was fined $35,241,500,000 in a three-and-a-half year period from 2011 to 2014 with many, many more cases it has lost since then and yet more lined up. Read that number again – it was fined 35 thousand million dollars in 40 months and no-one even got a slap on the wrist. And today, that same organisation, having made a profit of $33 billion – having been given a tax windfall of $4 billion, having pushed trillions of debt onto the taxpayer moans it is not earning enough!! Dimon is reportedly worth $1.3 billion himself. He earned over $30 million last year. In a just world, a world where justice and the rule of law were applied – everything Dimon owns should be taken back by the state and redistributed to the taxpayer – and he should be thrown in a federal prison with his co-conspirators forever, never to see the light of day again in order that social democracy can continue its great post-war project.